renowned and cherished in Russian homes for many years. becoming even larger. They are slow in maturing, becoming full grown in 5 years. Siberians have a strong muscular body and a firm build. They have a powerful musculature, and weigh more than they would appear to. Their legs are thick and strong, and their paws are large and round. 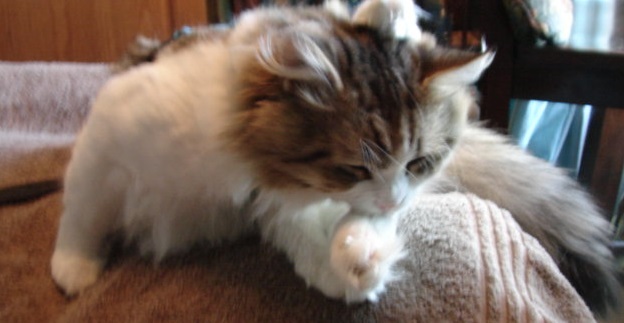 They have long hair tufts between their toes. . The Siberian’s coat is backed by long water-repellent hairs and a dense undercoat, which insulates them from the freezing cold, and is also water resistant. The collar and leg area are distinguished by a luxurious plumage. 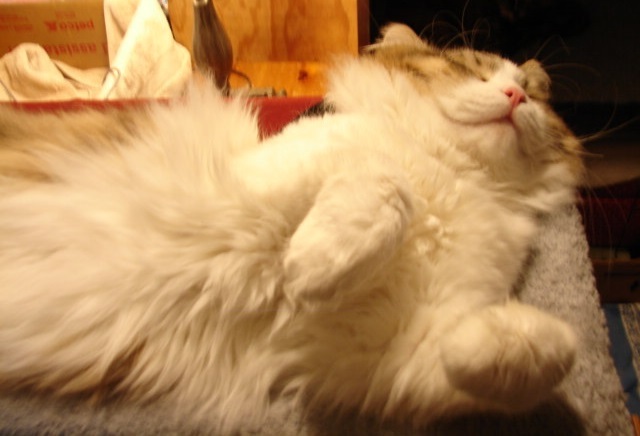 Siberian cats are known as calm, level and modest, yet they may be extremely active. These cats, being natural hunters, have great physical shape at all ages, they jump, climb and swim really well. As a natural breed, Siberians are quite healthy and are not subject to inherent flaws. and found that it was all about something else - something better than I even imagined. ....And the Lord had a treasure for me - Caleb. I ended up with Caleb with no expectations. but what I can tell you about, is my experience - with this Siberian. Gentle and benevolent - like a true king. He seems to give honor, yet seemingly knows that he is honorable. He doesn't have an aloof attitude, instead he honors out of honor. I've never experienced a cat like this before, and that is the only way in which I can describe it. He obeys the house rules, but I can tell it's because he decides he wants to, rather than being simply obedient to please his owner. This cat is on a different level, and once again, that's the best I can describe it. His honor is beautiful, as if he doesn't know how magnificent he is, for he is not arrogant - he's very much a true prince, and he lets his owner be king. - he just likes me. Siberians have lower levels of the most common allergen. I purchased Caleb from a US family who had imported him from Russia due to their daughter's allergies. The family was moving to another country for a several year assignment, and could not take their kitty. The daughter had snuggled with Caleb in her bed, without any problems due to her allergies. Beautiful cats and kittens, prayed over and blessed. Raised in a quiet home, with tender care. Would the grace of a Siberian be a blessing to your home?